As the news media cover the turbulent 2016 presidential election, there’s been considerable debate around how much emphasis they should put on inaccurate or potentially offensive statements made by candidates. A new Pew Research Center survey finds that while those who support Donald Trump are divided in their views on whether journalists should highlight statements that many may find offensive, supporters of both candidates overwhelmingly say the news media should draw attention to claims that are inaccurate. 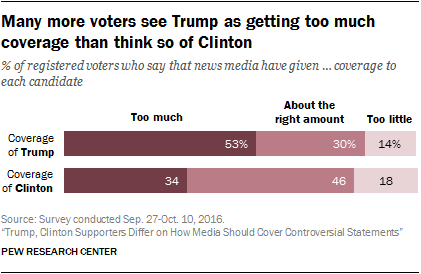 Additionally, more voters see Trump as over-covered by the news media than say the same of Hillary Clinton. The presidential campaign has been marked by controversy over comments made by the candidates. Some have offended groups of people, while others have included false claims. Should the media emphasize statements like these because it is important for the public to know about them? Or should the media let the statements pass because they unfairly give too much attention to one candidate? But Trump supporters are much more divided on this issue than Clinton supporters.Roughly half (49%) of Trump supporters want the news media to emphasize offensive statements, and about the same portion (45%) think that such statements should not be emphasized. There is much less disagreement among Clinton supporters. Roughly seven-in-ten (72%) favor emphasis, while only about a quarter (26%) do not. On the issue of inaccurate statements, there is broader support overall for the idea of enhanced media coverage – about three-quarters (77%) of registered voters favor emphasizing them. While Trump supporters again are less likely than Clinton backers to say this, substantial majorities of both candidates’ supporters prefer the media to highlight inaccurate statements. Fully 83% of Clinton backers favor emphasizing them, which is somewhat higher than the 71% of Trump supporters who say the same. Along with the clear sense that journalists have a role in emphasizing inaccuracies, the vast majority of registered voters (83%) also think that it is the news media’s responsibility to fact-check political candidates and campaigns. Nearly two-thirds (65%) say it is a major responsibility, while just 16% think fact-checking is not at all a responsibility of the news media. Majorities of both Clinton and Trump supporters take this position, though the sentiment is more common among Clinton backers. About three-quarters (77%) of Clinton supporters think it is a major responsibility of the news media to fact-check political candidates and campaigns. That’s higher than the roughly half (53%) of Trump supporters who say the same. 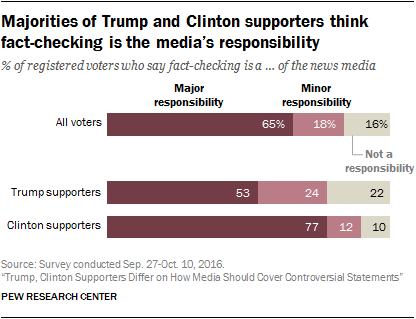 An additional 24% of Trump supporters and 12% of Clinton supporters say the media have some responsibility to fact-check. At the same time, this sense of agreement on fact-checking may be simpler in theory than practice. A new Pew Research Center report found that roughly eight-in-ten voters – including nearly equal shares of Clinton and Trump supporters – say the two sides cannot agree on the basic facts of important issues. Without a doubt, the election has been covered extensively. In July, most Americans were already worn out by the amount of coverage the presidential candidates and campaigns had received. But when the public considers the amount of coverage the specific candidates receive, Trump is far more likely than Clinton to be seen as getting too much. Around half of registered voters (53%) say Trump has been over-covered, compared with about a third (34%) who say the same of Clinton. 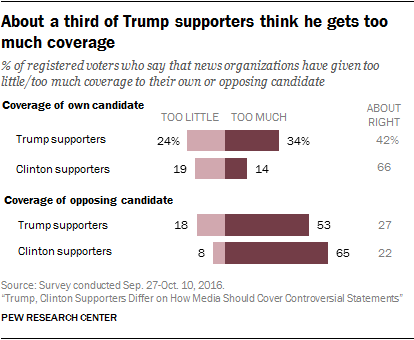 Even 34% of Trump’s own supporters say he gets too much coverage – 20 percentage points higher than the share of Clinton backers who say the same of their candidate (14%). On the other hand, the feeling that the opposing candidate has received too much coverage is mutual. Still, Clinton supporters are somewhat more likely to say this of Trump’s coverage (65%) than Trump supporters are of Clinton’s (53%). Overall, only 18% of registered voters say that both candidates receive too much coverage, while 27% say that neither candidate does.